Life rushes by, but there's always time for a good home-cooked meal. 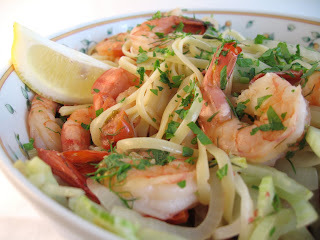 And here's an easy supper, with the light flavors of seafood and fresh, bright notes of fennel, tomato, and lemon. Adapted from Bon Appetit's "Fast Easy Fresh" series, this is a pasta dish you can fix when you're in a rush but are craving something healthy and homemade. The simplicity of the sauce--seafood juices, white wine, and a squeeze of lemon juice--lets the flavor and textures of the meaty scallops, curly shrimp, and tangy tomatoes shine through. And the colors are absolutely gorgeous, with pinks, pale greens, deep dark green, and reds against a backdrop of golden pasta. Slicing the fennel, I was taken by surprise as its aroma, delightfully tingling and fresh smelling, wafted up so distinctly each time my knife met the bulb. As a natural reaction to the pleasant smell, I inhaled deeply and was filled with a sense of happiness and peace. It's little, sensual moments like this that make cooking a part of well-being. A smell, a combination of colors, the texture on the tongue, or the sound of a sizzling pan--all of these can call for a pause to remember, savor, and enjoy the process. May you have many such moments in your own kitchen! Set a large pot of water to boil for cooking the linguine. While waiting for the water to boil, heat 1 Tbs. oil in a large skillet over medium-high heat. Add sliced fennel, onions, and garlic and sauté until slightly softened, about 7 minutes. Season with salt and pepper and transfer to a bowl. Salt the boiling pasta water and cook the linguine until just tender but still firm to bite, stirring occasionally. Drain, reserving 1/2 cup pasta cooking liquid. 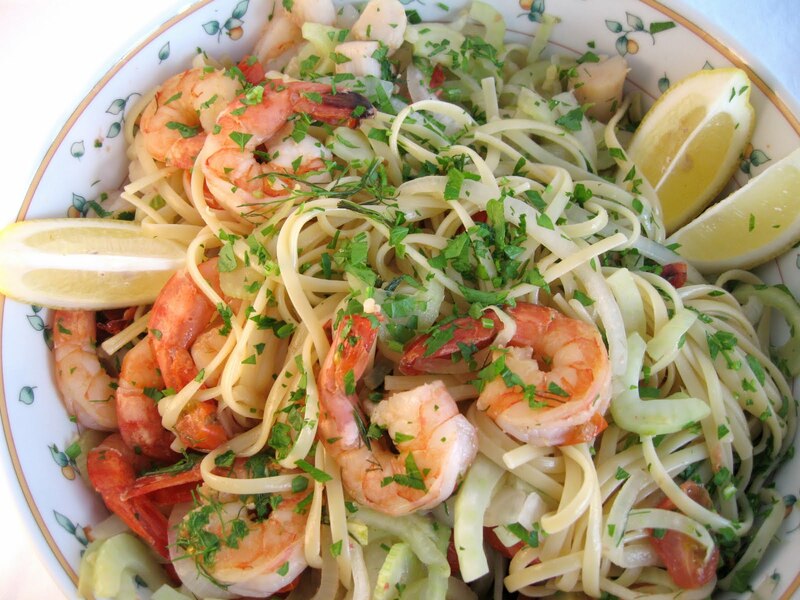 While linguine cooks, add remaining 1 tablespoon oil to skillet. Add shrimp and scallops, sprinkle with salt, and pour in white wine. Braise seafood, covered, until just opaque in center and shrimp becomes pink, stirring occasionally, about 2 minutes. 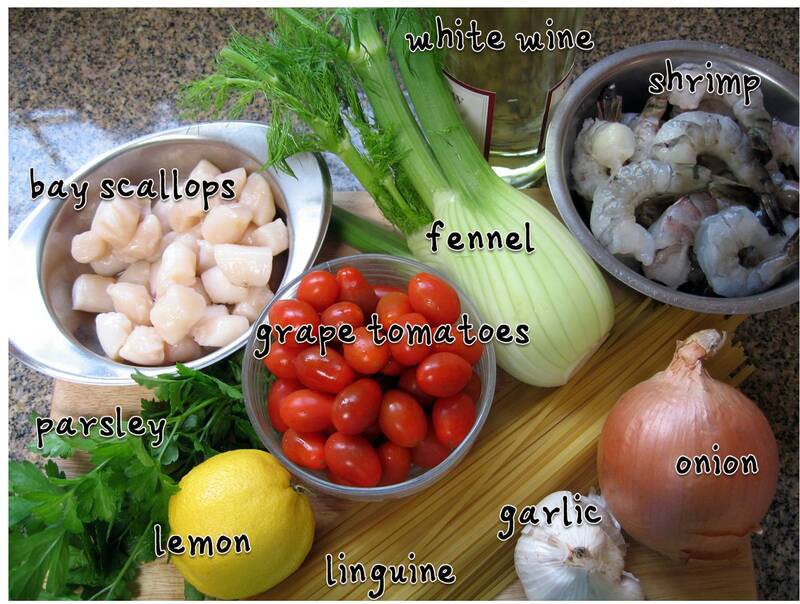 Using slotted spoon, transfer seafood to bowl with fennel-onion mixture. Add tomatoes to skillet and sauté until heated through, about 1 minute. Return fennel-onion mixture and scallops to skillet. Place drained pasta in a large, heated serving bowl. 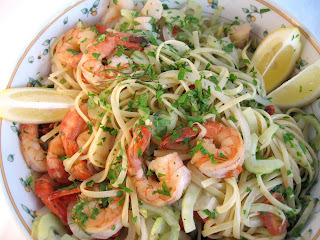 Pour over the fennel, seafood, tomatoes, and skillet juices and sprinkle over the chopped fennel fronds and 3 Tbs. parsley; toss to coat, adding reserved cooking liquid by 1/4 cupfuls if dry. 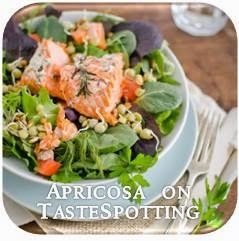 Sprinkle with remaining chopped parsley, and serve with lemon wedges and red pepper flakes. Hi there...came over from PW's. I love the way this recipe turns out; your final photo is so tempting! Great site!